Ah, this was good. My first citronette since starting this challenge. This salad is much lighter than some of my meals–perfect dinner since I had a burger with the kids for lunch…I love mint and lemon. I love grapes and walnuts. Toss some mushrooms in as delightful flavor sponges, and pile the bowl high with mixed baby greens–really perfect. 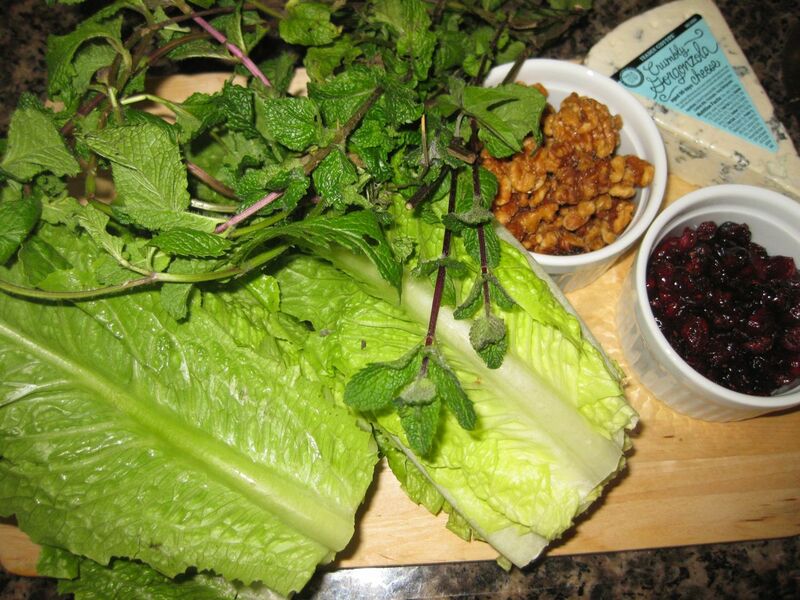 I perfected this salad over the holidays — the lovely red and green worked well for our family feasts. Since then, I’ve been tinkering with the recipe and enjoying it just because it is so quick and easy, and it tastes so beguilingly delicious. 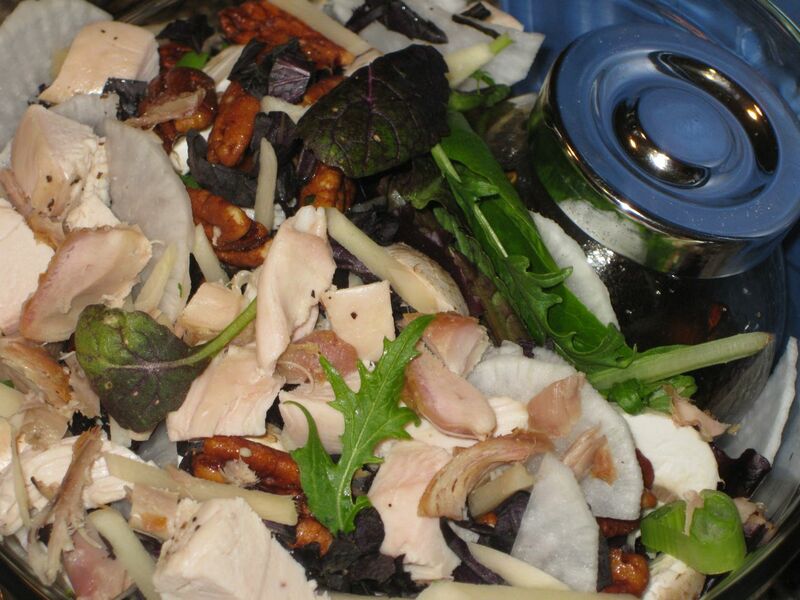 This salad works particularly well with pork roasts and turkey. The last time I made it was to share with fellow unschoolers at a potluck lunch, and it held it’s own alongside tortilla soup, a gorgeous spread of bread and cheese, and piles of fruit. All the ingredients, ready to assemble. 2 hearts of romaine, chopped. 1 large fistful of fresh mint, chopped. 3 T extra virgin olive oil. 1 T rice wine vinegar. 1 small clove garlic, smashed and minced. Pinch of salt, to taste. I started by mixing up my vinaigrette in a small jar. Then I built my bed of romaine and chopped my mint. 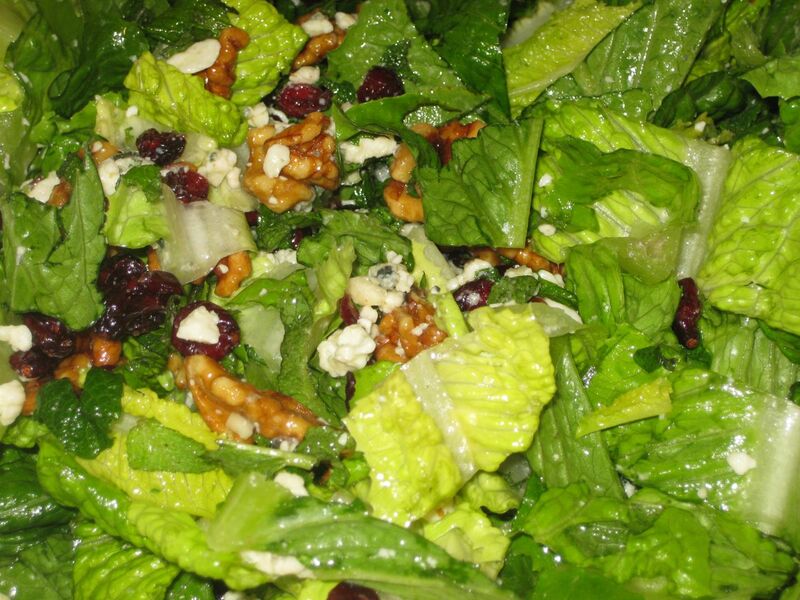 I sprinkled the nuts, cranberries, and gorgonzola over the crispy greens. Finally, I drizzled the light vinaigrette over it all, tossed, and served. The rice wine vinaigrette is subtle, and it blends perfectly with the tangy cheese. The cranberries add tart sweetness, and candied walnuts provide a lovely crunch. Mint livens the salad up, and gives it a unique twist. This is a straightforward, easy to make, and very impressive salad. It’s just that good..
I’ve eaten it as a meal, though it’s a tad sweet for me without something more savory beside it. It packs to go very easily — a great potluck salad. Just keep the vinaigrette separate, in a small jar, and drizzle it over the top when you’re ready to serve..
My husband loves spicy food. I can handle it, in small doses. He also recently requested “crazier” salads. I aim to please. I bought opal basil and young ginger at the Berkeley Bowl recently, as well as daikon and mixed asian greens. I wasn’t sure exactly how the salad would come together, but I knew I wanted to play with some slightly more unusual ingredients. 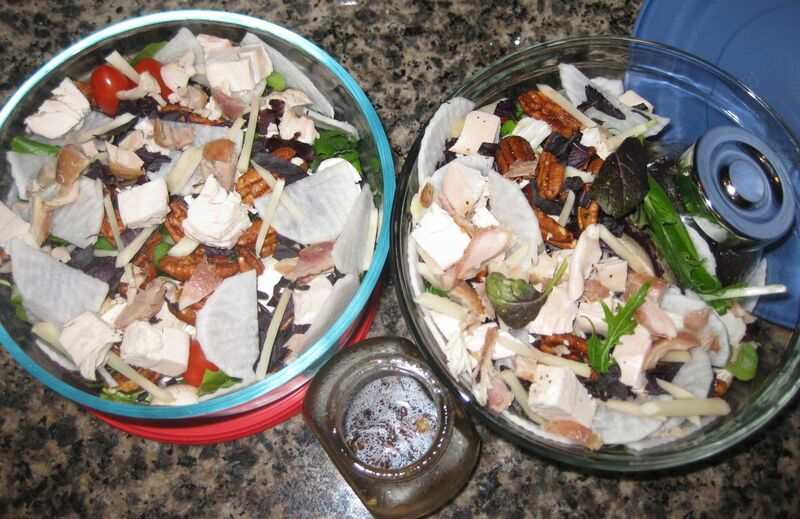 We both had busy days planned, so I made two matching lunch salads, packed to go. This was a perfect opportunity to really spice up his salad, and I did. Mine stayed mild enough for me to enjoy, and I made his salad hot hot HOT. Here are the ingredients, ready to face the blade. 4 cups of mixed asian greens, including mizuna, tatsoi, baby mustard greens, and baby romaine. 1 fistful of opal basil, chopped. 1 knob of young ginger, peeled, sliced, and cut into small matchsticks. 1/4 leftover roast chicken breast, cubed. 1/2 leftover roast chicken drumstick, shredded. 2 T extra virgin olive oil. 1 T dark sesame oil. 1-3 hefty pinches of red chili flakes, to taste. Twin salads ready to go! I doubled all of the ingredients above and made two matching salads, complete with vinaigrette. I began by mixing up the vinaigrettes in little jars, giving him three big pinches of red chili flakes to my one very small pinch. I tasted my dressing, and just hoped for the best for him. 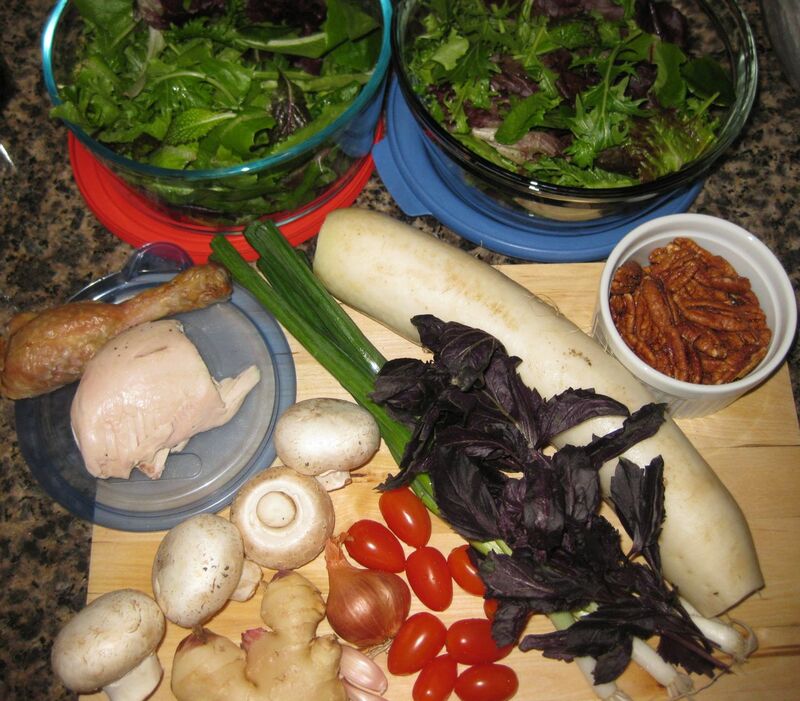 Then I created a lush bed of greens for each of us, and layered all of my other ingredients in two glass bowls. I chopped and sliced and sliced and chopped, putting my knife down only to use a spoon to peel the ginger and to use a fine Norwegian cheese slicer to quickly slice the daikon into perfect, thin circles. Finally, both glass bowls were full of a colorful, hearty salad. I nestled the salad dressing jars in the larger containers, popped the lids on, and we each went off for the day. Quick snapshot taken with my phone of the glossy beauty before I devoured it. This was really amazing. Like nothing I’ve tried before, at home or in a restaurant. Full of strong, punchy flavors that worked very well together. I liked the balsamic vinegar with the sesame oil, and the bits of ginger really sparkled. The walnuts and the daikon added crunchy joy, and the sweetness of the nuts and the tomatoes worked well with the spicy dressing and the peppery greens. It was crazy, in a good way. My husband loved the chili heat, and the explosive flavor. This is one that I’m sure I’ll revisit. Notice the dressing jar nestled cozily in with the salad. Finished Pear and Candied Walnut Side Salad, dressed and ready to toss. 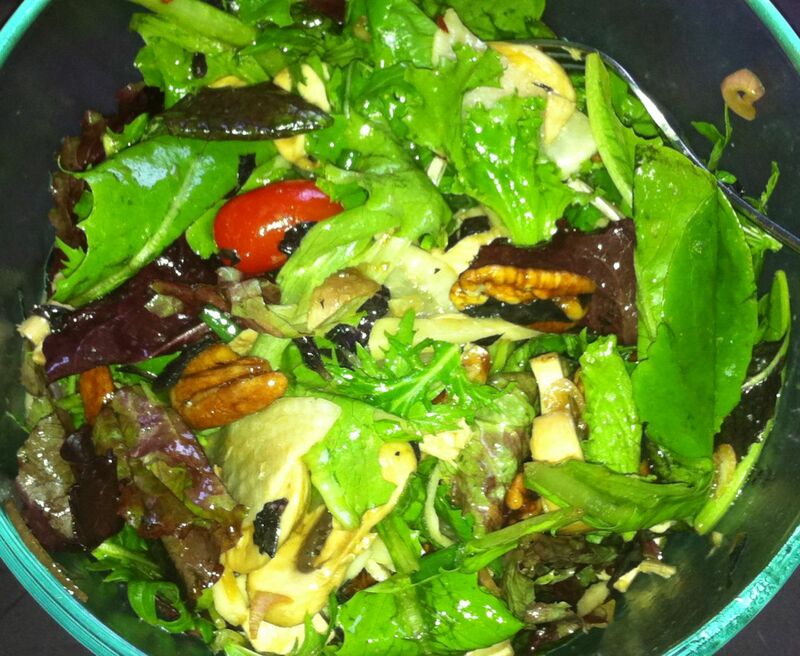 I needed a hearty green salad to accompany our steak, sauteed mushrooms, and creamy pasta. I wanted something a little sweet, and with a lot of flavor. I was also eager to try out the candied walnuts I’d picked up the day before at Trader Joe’s. 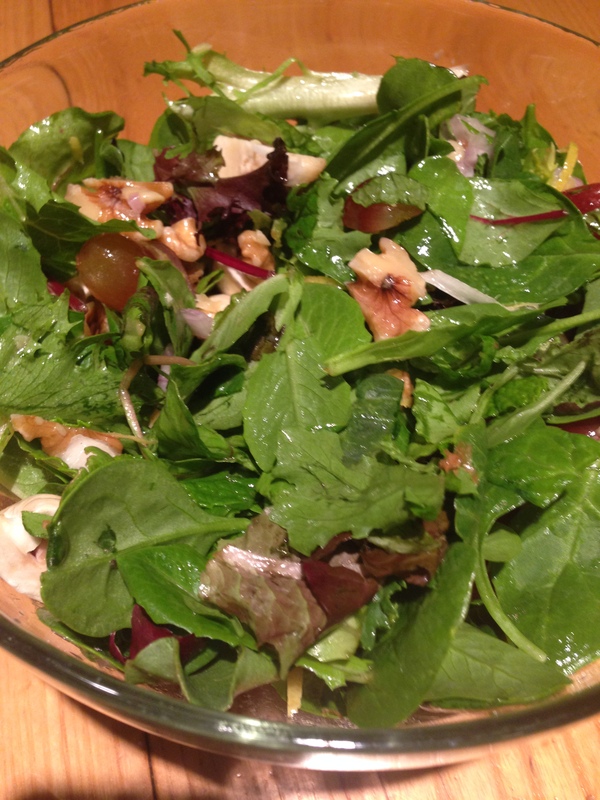 I settled on a hefty bed of arugula with pears and candied walnuts in a balsamic vinaigrette. I like creamy pears with crunchy nuts, and peppery arugula can definitely stand up to their sweetness. I chose the balsamic vinaigrette because it works so very well with juicy red meat, and I thought the deep flavors would help connect the fruity salad to the savory steak and mushrooms. 6 packed cups of arugula. 1/2 a cup of candied walnuts. 1 T of balsamic vinegar. 3 T of extra virgin olive oil. 1/4 tsp of maple syrup. 1 clove of garlic, crushed and minced. 1 pinch of salt, to taste. After seasoning the steaks and slapping them into my cast iron skillet, I mixed up my vinaigrette, filled the salad bowl with arugula, and tossed a generous handful of candied walnuts over the top. I also put the pasta (leftover from a previous dinner) into the microwave and heated it up. While the steaks rested, I sliced up the pear and added it to the salad. Once the salad was tossed, the steaks were ready for eating, and the pasta was warm. This entire meal went from fridge to table in about fifteen minutes. Which was good, because we were all starving after a very long afternoon at the park with our friends. Success! My husband was particularly fond of this combination. The salad was delicious, and it definitely rounded out the plate with vibrant flavor and veggies. The nuts were perfectly crunchy, and the sweet, creamy pear worked really well with the spicy arugula and the tangy balsamic vinaigrette. I think some steak sliced over the top would make a yummy meal. Very hearty and intense. That’s a tricky one. Pears can be put into a larger jar with the dressing, but really ripe ones (like we enjoyed) get pretty darn mushy. In a pinch, I’d do it, but I prefer to pack other fruit. Apples would be a good substitute, though you lose the delightful creaminess of the pears. Regardless, the fruit would definitely need to be tossed in the jar with the dressing to minimize browning. 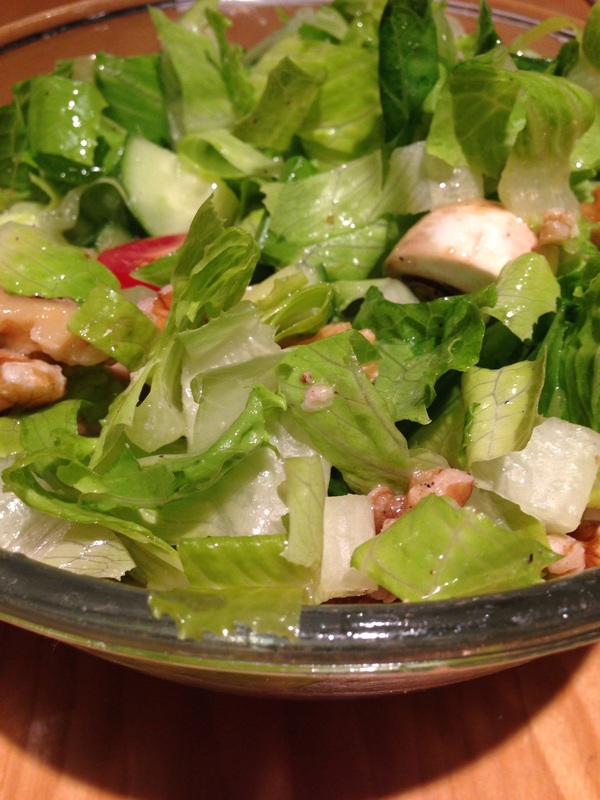 A large container full of greens and walnuts. A jar with dressing and fruit. When you’re ready to eat, just combine, fork toss, and enjoy.